In this section we take you to the Nord-Pas-de-Calais region of France which I visited in the summer of 2016 and again in 2018. France is now in the process of renaming this region to the “Hauts-de-France” region. The Germans had designated this area to be called “Freie Küste” which in German translates to “free coast or by the sea”. Here we will cover the Atlantikwall fortifications that comprise of the areas listed below and will feature key areas from Calais to Dunkerque, additional entries will be included on another visit. 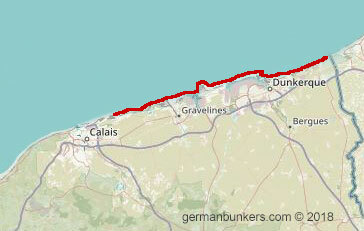 Map showing you the areas covered from Calais to Dunkerque.